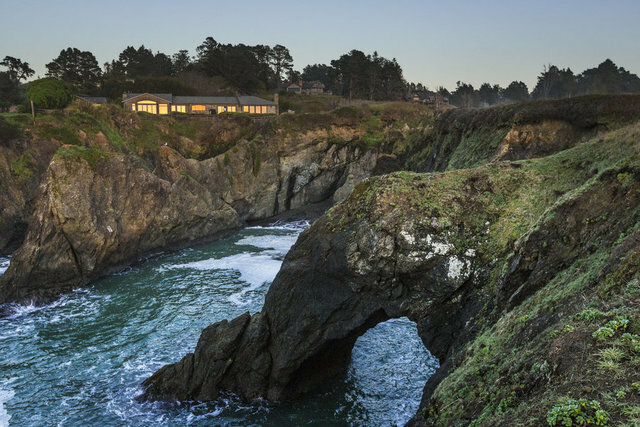 Stunning ocean-front estate nestled on a beautifully landscaped parcel just north of the historic village of Mendocino. Remodeled by its current owners, this home takes full advantage of its tranquil setting perched on dramatic cliffs overlooking a breathtaking cove. A private gated entrance and a drive through beautifully landscaped grounds leads you to this home's front door. Once inside, you are immediately struck by the open interior and the expansive ocean views framed by the numerous windows in the living and dining rooms. The walls and ceilings of these two rooms feature old-growth redwood with a rich patina. They blend perfectly with the off-white French tumbled-marble flooring and the large river stone natural fireplace that anchors the living room. The gourmet kitchen, with its slate floor and granite counter tops, is a dream to work in. No expense was spared in equipping this chef's kitchen with all of the latest culinary equipment and stainless steel appliances including a Bosch dishwasher, a hot water dispenser, a sub-zero double door refrigerator, two separate wine coolers, a double Dacor oven, a warming oven and a built-in microwave. The center island features a butchers block top, a six burner Dacor range, a hanging pot rack and room for four stools. Next to the double oven is a second sink with five feet of extra granite counter space. The window behind the sink area has an ocean view that will take your breath away. Adjacent to the kitchen is a butler's pantry with wine storage. The 950+ sf master suite consists of an entry area, separate laundry, garden reading room and a walk-in closet. It has an integrated king-sized bed headboard, and a custom-built wood and marble fireplace. The old barn wood floor gives the room a feeling of warmth, and its muted, neutral palette channels the moody blues to echo the ocean. Outside its sliding doors you can easily get to your private hot tub with a fantastic ocean view. At night stars and moon are your personal companions. The ensuite bath with granite-topped double sinks, has beveled mirrors running from the counter to the ceiling. A large jetted tub, which overlooks the ocean, has a radiant heating surround. The separate marbled shower includes a waterfall shower head, heated marble bench & floor and a built-in private steam room. The guest bedroom and tiled bath with double shower are on the opposite side of the house from the master bedroom, providing privacy to both the owners and their guests. This guest room has its own exterior door leading to the gardens on the south side of the home and due to its southerly exposure, enjoys light for most of the day. One of the true treasures of this residence is the in-home office and TV room. This retreat sports a high wood-coffered ceiling, solid walnut wainscoting, built-in desk, cabinets and bookcases, a built-in Bose sound system and a warm, 100-year-old oak barn wood floor.